It was my birthday last April 12 and my mom cooked a kilo of Pinoy-style Spaghetti Sauce. It just so happened that the sauce is not enough for a kilo of spaghetti. So what was left, about 40 grams of cooked pasta without sauce to enjoy with left in the fridge. I don’t want to waste this bunch of pasta so searching for ingredients to go with the pasta, what I’ve found in our sari-sari store (I hope my mom wouldn’t find out.) a brick or 250mL of Nestle All Purpose Cream. There goes the light bulb, carbonara! I went last night to Robinson’s Supermarket along Mercedes Avenue (Luckily, it’s just walking distance away from our home.) I grabbed a pack of sausage, shitake mushroom and a bunch of parsley. 1. Saute sausage in olive oil until cooked. Add garlic, onion, shitake mushroom, parsley and Italian Seasoning. 2. Add the all purpose cream, cheese and water and simmer for about 5 minutes. Remove from heat and whisk in the beaten egg until creamy. Season with salt and pepper to taste. Toss in the pasta. Garnish with chopped parsley. 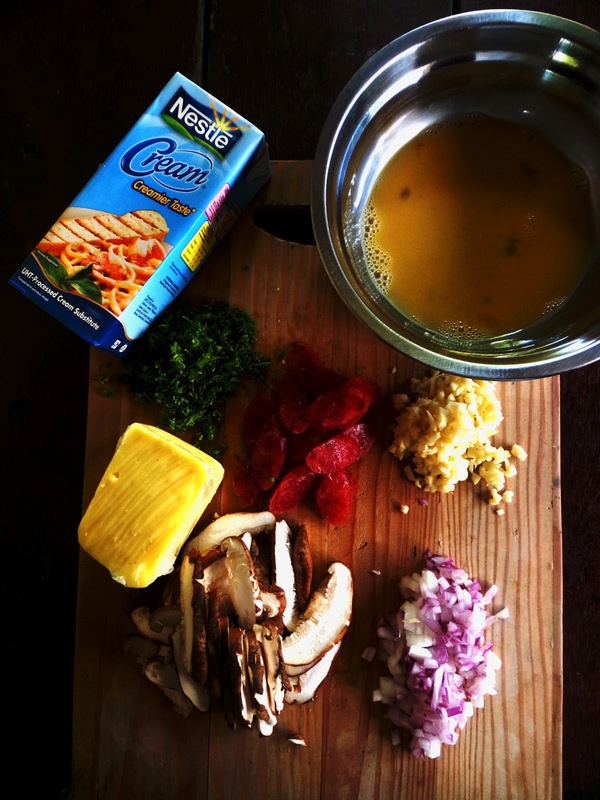 The carbonara sauce is not that overwhelmingly rich. I think adding Italian Seasoning helps in balancing the richness of the cream and cheese. 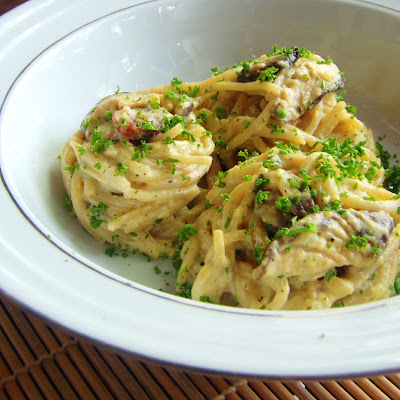 The sausage gives that smoky flavor to the carbonara with that fresh taste of parsley and earthy flavor of the shitake mushroom will surely linger your taste buds.